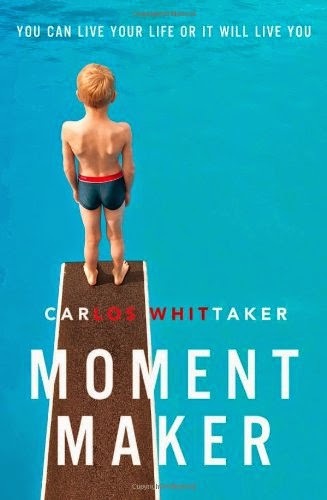 Behold & Reflect: Review of Carlos Whittaker's "Moment Maker"
My bookish friend and I recently finished reading worship leader and blogger Carlos Whittaker's Moment Maker: You Can Live Your Life or It Will Live You. It's a quick read fully of interesting stories, at turns heart-wrenching and humorous. But at first, I was a little frustrated by this book. I was waiting for it to methodically instruct me in the art of living in the moment and making the most of life's moments. That sounds a little absurd now that I've typed it. But my misconception was fueled in part by phrases on the back cover like "Carlos guides..." and "Carlos shares... his methodolgy for living on purpose." The book's many emotionally charged stories are also loosely organized into three sections, "Created Moments," "Received Moments," and "Rescued Moments" and the book's Afterword outlines the "Moment-Making Method." However, when I tried to imagine what I needed to do in order to be more moment-oriented, I found that the actual steps Whittaker shares are somewhat vague and at times conflicting. Should I be capturing moments with my pen and camera, or should I put down my lens so I can really live these moments? Whittaker seems to argue both in his chapter on the birth of his second daughter. Should I heed the call to "Go! Blaze!" or should I pause? Whittaker argues both. So I stopped trying to read it like a guidebook or a How-To, and that made all the difference. I let this book be what I think it really is: a memoir of moments from the life of one of my brothers in Christ. From this perspective, I could receive some lessons that instructed my heart. When my kids are having a moment, I don't need to push them or try to fix them. Sometimes drawing out the awkward pause, listening rather than trying to offer solutions, allowing the tears to drop and holding them in a full-attention hug is the best I can give. See Whittaker's stories about of the tragic end of his daughters' butterfly farm, his daughter's accepting Jesus and their family trip to help recover tornado victims' prized belongings. Explore every day. Whittaker sets his alarm to remind him to take in his surroundings and get inspired for future moment-making possibilities. And then he writes them down in his folder of more than 34,000 ideas! Allow God to speak through others. Even the bearded barista or the music-loving homeless guy. If you can't measure up to your competitors, use creativity to showcase your unique skills. It might work, as it did for an out-of-shape college student auditioning to be a roaming character at Disneyland. So, in conclusion, I like the intention of this book, and even though his personality is probably the polar opposite of my own, I like Carlos Whittaker's spontaneity, creativity and interest in others. He doesn't really have a method to his moment-making maddness, but he does exemplify the greatest commandment to love God and love others as himself.